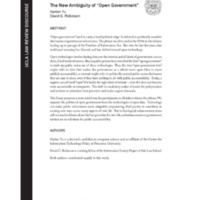 YU, Harlan; ROBINSON, David G.
“Open government” used to carry a hard political edge: It referred to politically sensitive disclosures of government information. The phrase was first used in the 1950s in the debates leading up to passage of the Freedom of Information Act. But over the last few years, that traditional meaning has blurred, and has shifted toward open technology. Open technologies involve sharing data over the internet, and all kinds of governments can use them, for all kinds of reasons. Recent public policies have stretched the label “open government” to reach any public sector use of these technologies. Thus, the term “open government data” might refer to data that makes the government as a whole more open (that is, more publicly accountable), or instead might refer to politically neutral public sector disclosures that are easy to reuse, even if they have nothing to do with public accountability. Today, a regime can call itself “open” if it builds the right kind of website—even if it does not become more accountable or transparent. Th is shift in vocabulary makes it harder for policymakers and activists to articulate clear priorities and make cogent demands. This Essay proposes a more useful way for participants on all sides to frame the debate: We separate the politics of open government from the technologies of open data. Technology can make public information more adaptable, empowering third parties to contribute in exciting new ways across many aspects of civic life. But technological enhancements alone will not resolve debates about the best priorities for civic life, and enhancements to government services are no substitute for public accountability. 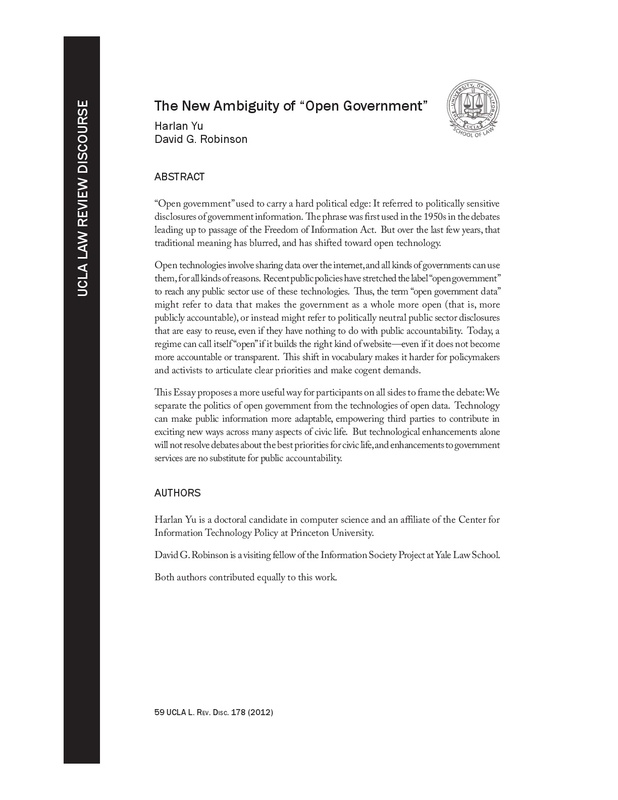 YU, Harlan; ROBINSON, David G. , “The New Ambiguity of “Open Government,” Curadoria Enap, acesso em 18 de abril de 2019, https://exposicao.enap.gov.br/items/show/284.